The pictured rove beetle is wingless with a slender elongated body that gets to 1.5-2 cm long. This beetle's colouring depends on its habitat: individuals on beaches with pale sand are pale brownish or tan in colour, while those on dark beaches are mottled pale and dark brown. There is a large number of rove beetles in North America, and so taxonomic expertise may be required to confidently identify this species. Click here for a key to the rove beetles (Family Staphylinidae) of North America north of Mexico. More photos of this species can be found on the BugGuide species page. 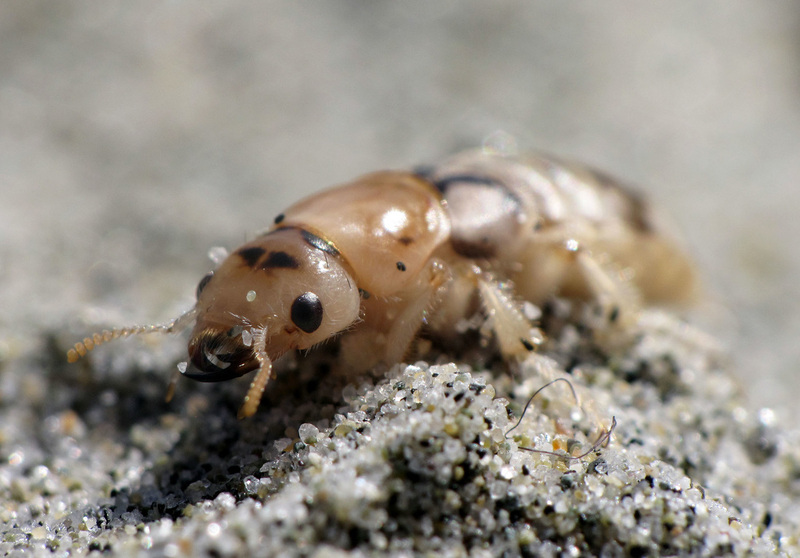 This nocturnal species is found in the intertidal zone on sandy beaches from Alaska to Baja California. During the day adults and larvae shelter beneath kelp or in temporary burrows in the sand. This species primarily preys upon beach hoppers such as the pale beach hopper (Megalorchestia columbiana). 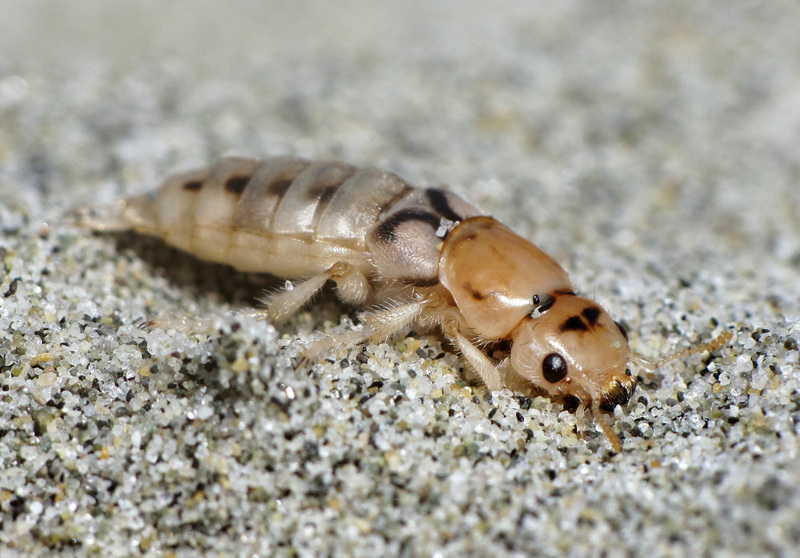 It is an ambush predator, and is able to attack a beach hopper within a range of a few centimetres while the beach hopper is gearing up to jump away. Click here for more information on this beetle's predatory tactics. Carefoot, T. Thinopinus pictus LeConte, 1852. In Klinkenberg, Brian. (Editor) 2017. E-Fauna BC: Electronic Atlas of the Fauna of British Columbia [efauna.bc.ca]. Lab for Advanced Spatial Analysis, Department of Geography, University of British Columbia, Vancouver. Accessed 28/30/2018. Frank, J.H., Ahn, K.J. (2011). Coastal Staphylinidae (Coleoptera): A worldwide checklist, biogeography and natural history. Zookeys 107:1-98. Species Thinopinus pictus - Pictured Rove Beetle. BugGuide. Accessed 28/03/2018.